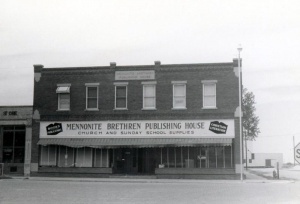 Mennonite Brethren Publishing House when located in Hillsboro, Kansas. The Mennonite Brethren Publishing House was the official publishing house of the Conference of the Mennonite Brethren Church of North America in 1956. It had its inception in 1904 in Medford, Oklahoma. Before this time the Zionsbote, the official organ of the Mennonite Brethren Conference, had been issued since 1884 with J. F. Harms as editor. Printing of this periodical had been done in Elkhart, Indiana, in Canada, Kansas, McPherson, Kansas, and Medford, Oklahoma, Editor Harms having resided at the latter three places. At the 1903 conference the decision was reached to purchase a conference printing plant in Hillsboro. The churches were to raise the money for this purchase within 30 days. Sentiment in the churches, however, showed that they would rather establish a new conference publishing house; consequently J. F. Harms purchased machinery and a suitable building in Medford, where he resided at the time. Thus the Mennonite Brethren Publishing House was begun. Here the Zionsbote, Lektionsblaetter, and Golos, a periodical in the Russian language, and other publications were produced. In 1906, since Harms was unable to continue as editor and manager of the new publishing house, the conference decided to move the business to McPherson. This was done and Abraham L. Schellenberg became the new editor and manager. Early in 1913 a printing establishment was purchased in Hillsboro, Kansas, and the entire business was moved here. Through this purchase the Vorwaerts, a weekly paper, was acquired. In 1939 this became the Hillsboro Journal and in 1953 it was amalgamated with another local paper. In 1915 a large building was constructed to house the printing and publishing plant, and modern equipment was installed. In 1922 a complete bookstore was added. A major addition to the building was completed in 1950. Other additions and equipment were added from time to time. A. L. Schellenberg continued to serve as editor and manager 1907-1927, with the exception of 1919-1922. P. H. Berg was manager in 1930-1948 and editor 1951-1953. Others who have served in leading positions for shorter periods of time are J. D. Fast, A. J. Voth, and J. J. Gerbrandt. Orlando Harms served as editor and manager after 1954. Since 1936 English Sunday-school quarterlies and the Christian Leader, an English Conference periodical, were produced in addition to the above-named German publications. In addition to these, many books, pamphlets, and much job work was produced throughout the years. In 1953 and 1954 two editions of the Mennonite Brethren Church Hymnal, the first official songbook of the denomination, were produced. The Mennonite Brethren Publishing House was the property of the Conference of the Mennonite Brethren Church of North America and was controlled by the Publication Board, part of which was elected at each triennial general conference. The size of this board varied through the years but in 1956 it consisted of seven members who represented the various districts of the Conference. Harms, Orlando. "Mennonite Brethren Publishing House." Global Anabaptist Mennonite Encyclopedia Online. 1957. Web. 21 Apr 2019. http://gameo.org/index.php?title=Mennonite_Brethren_Publishing_House&oldid=133236. Harms, Orlando. (1957). Mennonite Brethren Publishing House. Global Anabaptist Mennonite Encyclopedia Online. Retrieved 21 April 2019, from http://gameo.org/index.php?title=Mennonite_Brethren_Publishing_House&oldid=133236. Adapted by permission of Herald Press, Harrisonburg, Virginia, from Mennonite Encyclopedia, Vol. 3, pp. 604-605. All rights reserved.